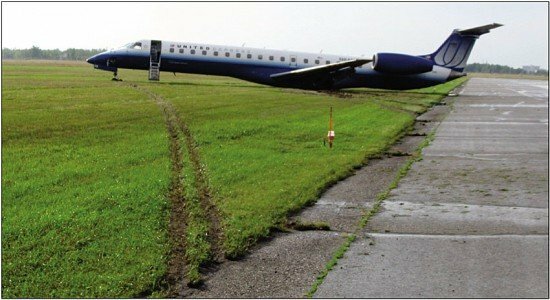 The Transportation Safety Board of Canada (TSB) concluded that the 4 September 2011 runway excursion of an Embraer 145 at Ottawa/Macdonald-Cartier International Airport was caused by an unstabilized approach and improper braking technique during heavy rain. United Express Flight 3363, operated by Trans States Airlines, at the Ottawa/Macdonald-Cartier International Airport. The Embraer 145, United Express Flight 3363, operated by Trans States Airlines, originated in Chicago and was bound for Ottawa with 44 passengers and 3 crew members aboard. The flight landed on runway 32 during heavy rain. Shortly after touching down, the aircraft skidded off the left side of the runway, approximately 7,500 feet from the threshold. During the runway excursion, both of the main landing gear collapsed, damaging the wing and causing a fuel leak. Everyone aboard evacuated the aircraft safely and there was no fire. The investigation found that the aircraft speed during the final approach exceeded the company’s stabilized approach criteria. Despite this, the crew did not perform a go-around, as per procedure when airspeed limits for the approach are exceeded. Just prior to landing, the crew applied engine power, which caused the aircraft to touch down 3,000 feet further from the threshold. The aircraft then hydroplaned on the wet runway due to the higher landing speed, a soft landing and the use of the emergency/parking brake, which disabled the anti-skid system and prolonged the skid. The aircraft then lost directional control while hydroplaning and veered off the left side of the runway. Following the occurrence, the Ottawa International Airport Authority bought two rapid deployment emergency shelters to provide shelter from the elements following an emergency evacuation. The airport also plans to undertake a complete resurfacing of runway 14/32, including grooving the pavement and including 300m runway end safety areas (RESAs), similar as to what was done on runway 07/25 in 2012-13. In addition, Embraer made revisions to its E145 aircraft maintenance manual to clarify and ensure consistency of the information on the brake system.